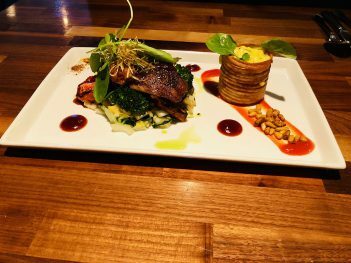 Anna’s take: I sampled several different dishes at Oakley’s Bistro on the north side of Indianapolis, all of which blew me away. The meal started with chef Steve Oakley’s famous shrimp corndog, the recipe that beat Bobby Flay last year in a 2017 Food Network broadcast of “Beat Bobby Flay.” The corndogs are al a carte are $2.75 each. They consist of cocktail-sized shrimp dipped in Oakley’s secret corndog batter and then fried. They are topped with bistro honey mustard, lending a sweet finish. The corndogs are topped with microgreens. I then ordered the Lobster Waffle ( $14.75). This was my favorite dish because of its taste and uniqueness. Essentially, the Lobster Waffle is exactly as it sounds – a basil roasted garlic waffle topped with lobster bites, sautéed zucchini, crispy leeks, mustard cream and tomato jam. It is an exotic twist on the traditional chicken-and-waffles dish, and it was phenomenal. I then tried the Three Little Pigs ($16.75), which are three small, individual pork dishes. One is a suckling pig croquette. Another is a country pate. The other is pork belly. This dish was rich and decadent. If you look closely throughout the restaurant, pigs are everywhere in the decorations because chef Oakley loves to create pork-centered dishes. For my entrée, I opted for the tilapia. The thick slab of mild fish is served with a side of butternut squash risotto inside of an edible potato basket, adorned by pine nuts around the plate. The tilapia is seared and served atop baby, tender vegetables and whole-roasted tomatoes. A tomato fennel fondue adds a bright flash of color. Much of the menu changes seasonally, but a few items are staples, such as the Mac-N-Goat Cheese ($6.75), which is mixed with a pesto sauce. The goat cheese gives the dish a rich taste. Don’t skip this side because it is rich and delicious. For dessert, my sweet tooth craved the chocolate whiskey cake ($8.75), served with caramelized bananas, chocolate mousse and a hearty scoop of Cookie Monster ice cream. It was a fantastic finisher. Suggested pairings: If ordering the tilapia, pair it with a 2017 Joseph Drouhin Macon-Villages, a dry, white French Chardonnay that tastes minerally and crisp, not oaky and buttery. For the beer drinkers, order the Hefeweizen Grapefruit Bier Schofferhofer.